Fissure 8 is beauty & the beast. Since Saturday it’s been pumping out a huge volume of lava, creating pahoehoe and even a’a flows that occasionally surge up to ~600yards/hour. Yesterday its main flow headed NE, skirted the geothermal plant, crossed and followed Hwy 132 for a while, and then started downslope past Noni Farms towards Four Corners, threatening to cut off Kapoho and Lower Puna. 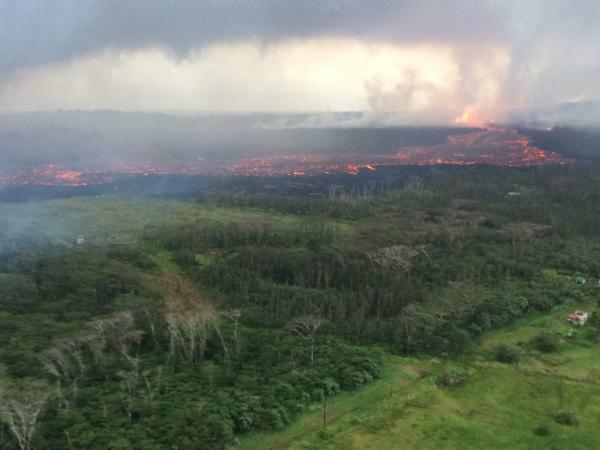 In the early morning hours, officials went door-to-door in the Kapoho area ordering emergency evacuations. Newly-paved Beach Rd was pressed into service as a one-way evacuation route from Four Corners to Hawaiian Beaches. But it’s a race against time, as the lava is headed for that very road. 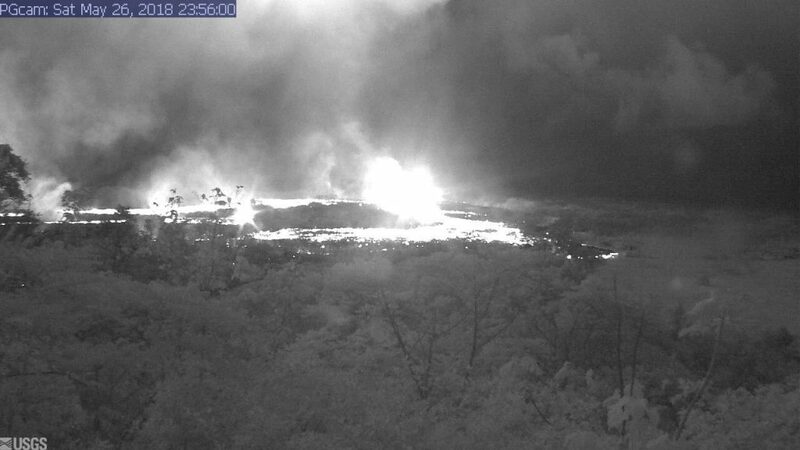 The dramatic light show I noticed on the East Rift Zone webcam last night was probably from fissure 7, featured on today’s Mick Kalber helicopter flyover (warning: noisy). May 25: End of the Road for Leilani Estates? It looks like the coup de grace for Leilani Estates, or at least its eastern part. 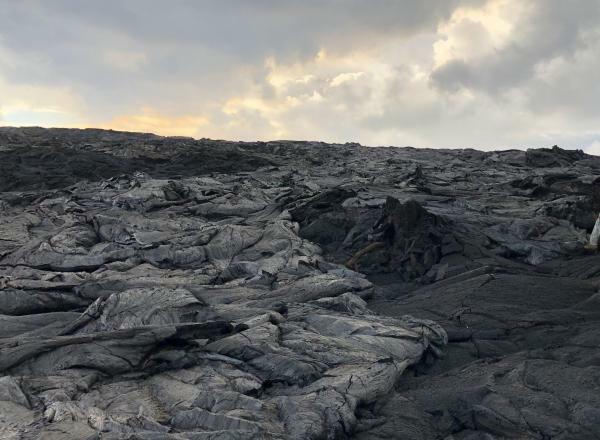 Three weeks ago Leilani’s streets were lacerated by fissures, battered by lava spattering from cracks, and blocked off by ponderous flows that seldom traveled far from their source. But that was a slow-motion disaster. Most fissures were active only a few hours. While a few unlucky residents lost homes in the first wave, most were able to return and collect vital possessions, or even risked dangerous fumes to stay. Last week, the main lava activity shifted east, downrift, overrunning smaller Lanipuna Gardens, threatening the PGV geothermal plant, and inundating fields and woods where homes were more scattered. 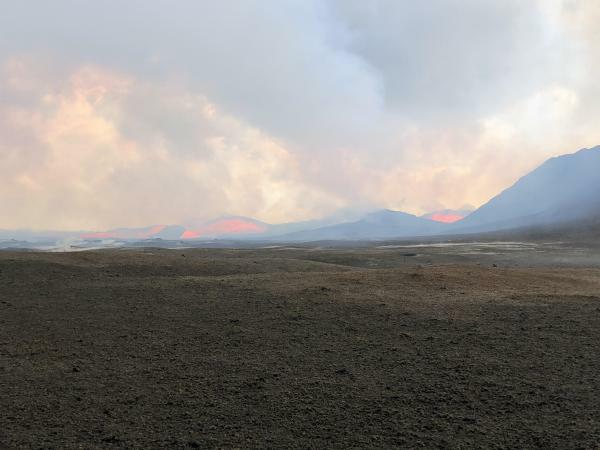 “Hotter, fresher” magma arrived last Thursday with a roar, spurting in several-hundred foot fountains and flooding forests with rivers of fast-moving pahoehoe lava. On Saturday night, these channels reached the ocean. Today, more streets were buried. Firefighters went door-to-door urging the last holdouts to flee before lava reaches them. 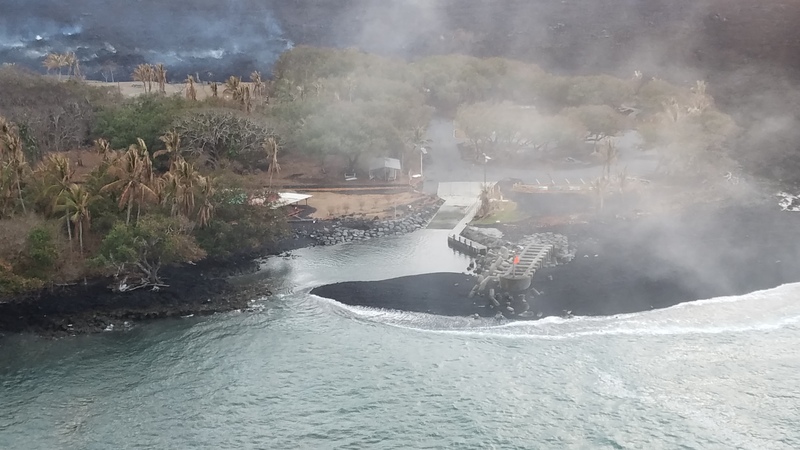 Even parts of lower Puna not yet menaced by lava were ordered to leave before their remaining escape routes are cut off. Just in case, authorities have sent in the Marines. 82 structures lost. A two mile stretch of fissures in a residential area is pouring out an astonishing 40-60 cubit feet per second. And yet only 3.4 square miles have been covered by lava in this eruption, on an island of over 4000 square miles. But that doesn’t make it any easier for those affected. Below, a roundup of Friday’s images, videos, USGS news, and reports from local news stations. Continue reading May 25: End of the Road for Leilani Estates? 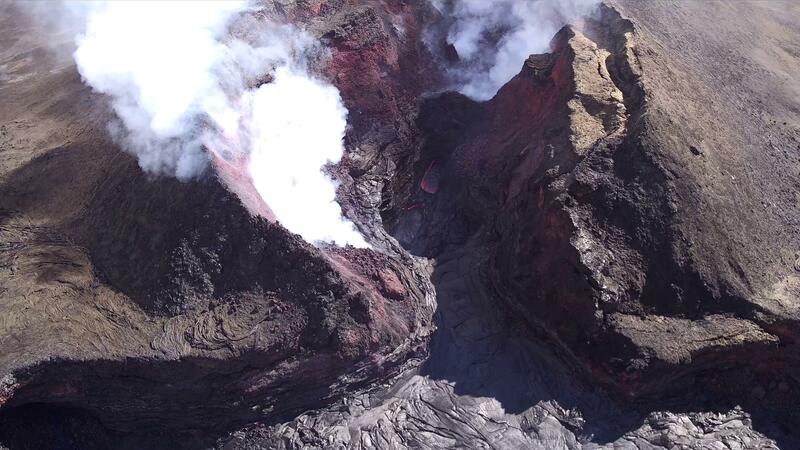 Before this, the main thing USGS was using drones for was LIDAR, but today’s Photo & Multimedia entry on HVO’s website provides drone footage for both the summit steam/ash plume and Leilani/Puna lava flows. This video was filmed on May 21, 2018, with a UAV (unmanned aerial vehicle). 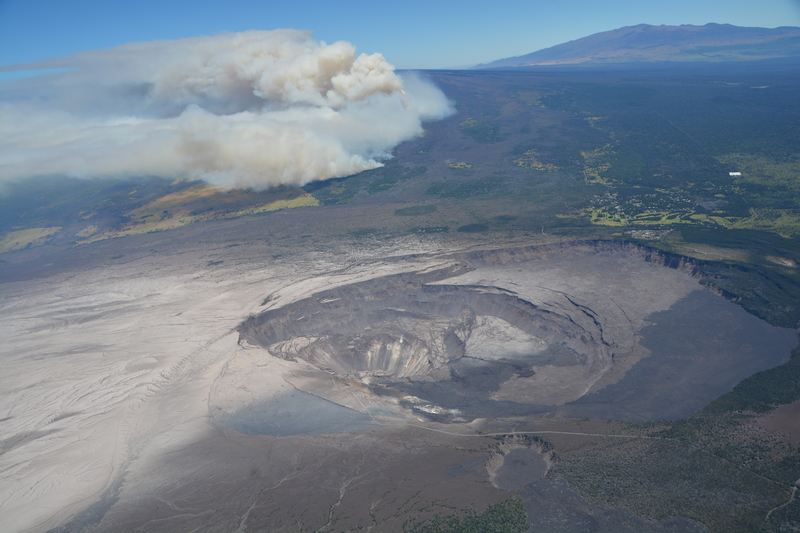 Limited UAV flights above the hazardous Kīlauea summit area, which is currently too dangerous for geologists to enter for ground observations, are conducted with permission from the National Park Service. […] At Kīlauea Volcano’s summit, a nearly continuous plume of gas and steam billows out of the Overlook vent and drifts with the wind. Explosions are occurring about two times a day, producing ash that rises to a height of between 8,000 to 10,000 feet above sea level. Small ash emissions occur more frequently. The larger explosions produce ash that is blown downwind, and trace amounts have fallen in nearby communities. Addendum: there was a 6PM 10,000 foot ash explosion & plume this evening (Civil Defense photo, USGS video), sending ash southwest. 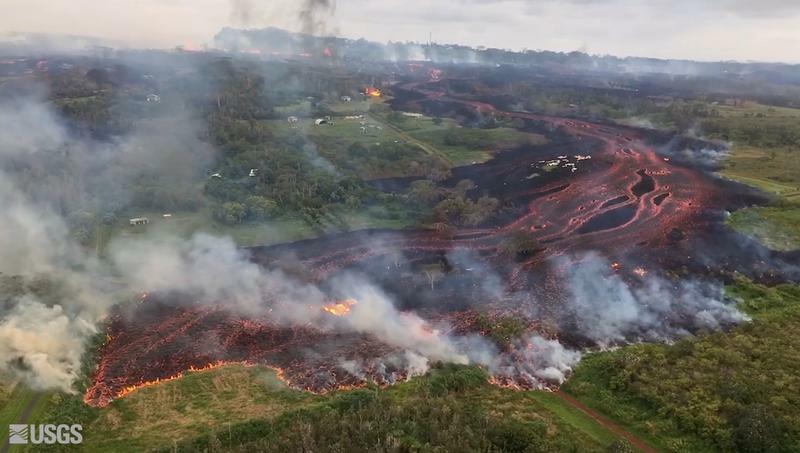 HVO’s Photo & Multimedia blog also posted impressive Hilo Civil Air Patrol aerial photos of the lava rivers from yesterday, as well as an image of Fissure 22 taking a nap (it’s still going but lower today on Civil Beat’s Livestream) while the fissures west of it (and uprift) that activated yesterday inundated Leilani Estates. As an aside: people keep posting ridiculous rumors, so the USGS had to reassure everybody that Mauna Loa is NOT erupting. The residents are being absolute champs in coping with this. Here’s another video clip of the lava lake with the homeowner whose home is just outside of it. They’re very philosophical, realizing they took a gamble, which is more mature than some of the people criticizing them for taking a chance on a place that hasn’t had an eruption in about 60 years. And they’re helping one another. Oh, my mistake. It’s a lava pond. 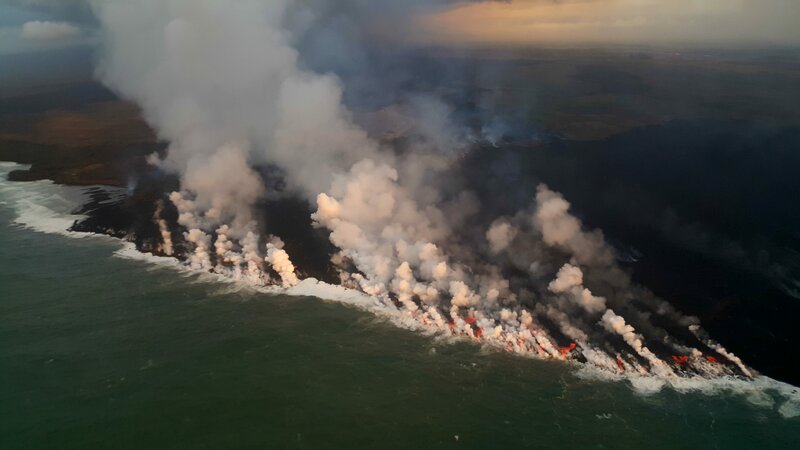 Kilauea message: Fissure 22 lava output has increased a bit over the past several hours and its lava channel to the ocean entry is consequently a little more incandescent. Low-level spatter at fissures 15 and 16. Fissure 13 has a low fountain through its lava pond. Mick Kalber’s helicopter overflight video today does a great job of showing the “pond,” the fissures headed from there past the geothermal plant, and the lava rivers flowing south from those fissures towards the ocea. 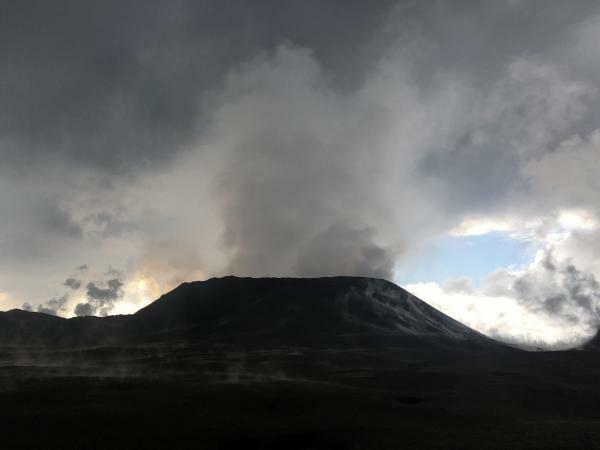 Thursday May 18: Fissure eruptions went into overdrive [Good article from Star-Advertiser] as “fresher, hotter magma” (Janet Babb, USGS geologist) arrived from summit. Fissure 20 released a lava flow down toward coast, crossed Pohoiki Road, and isolated about 40 houses. Four cut-off residents were airlifted out. Check out daylight screencap from late in the broadcast to get sense of scale: note house. May 19, Friday afternoon, a new livestream started from same channel as before (civilbeat.org). They streamed through most of the night, occasionally shifting view from large fountain behind house (Fissure 17) to lava flow and a group of lava fountains building spatter ramparts (Fissure 20 merged with others) upslope to the right. You can really tell this is hotter, fresher, more voluminous lava that drained from Pu’u O’o, as opposed to the old, stiffer, cooler lava that erupted from fissures in Leilani Estates the first two weeks of this eruption. 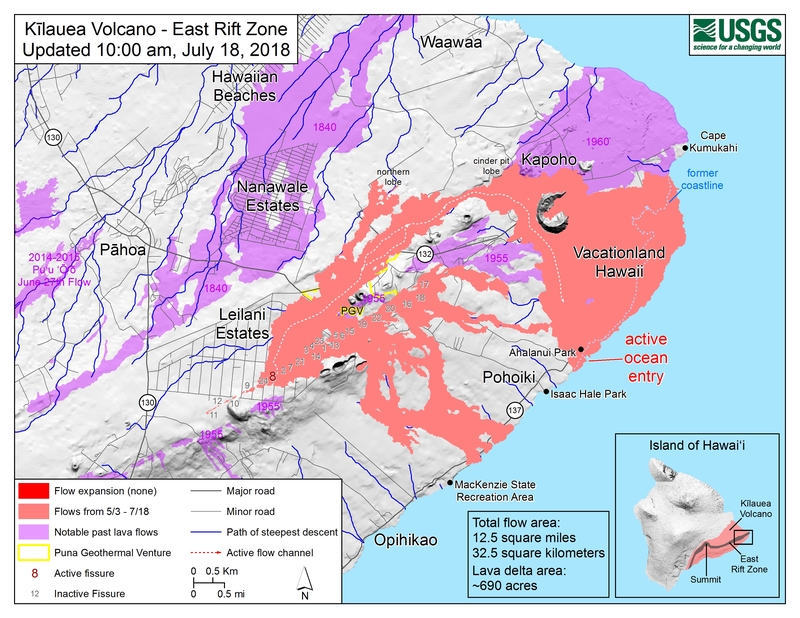 “Ground deformation is continuing with increased seismicity” in Lower East Rift Zone, and USGS warn lava inundation below them is possible, and that more fissures could still open uprift or downrift. “All fissures are actively spattering or actively degassing.” 40 structures lost. 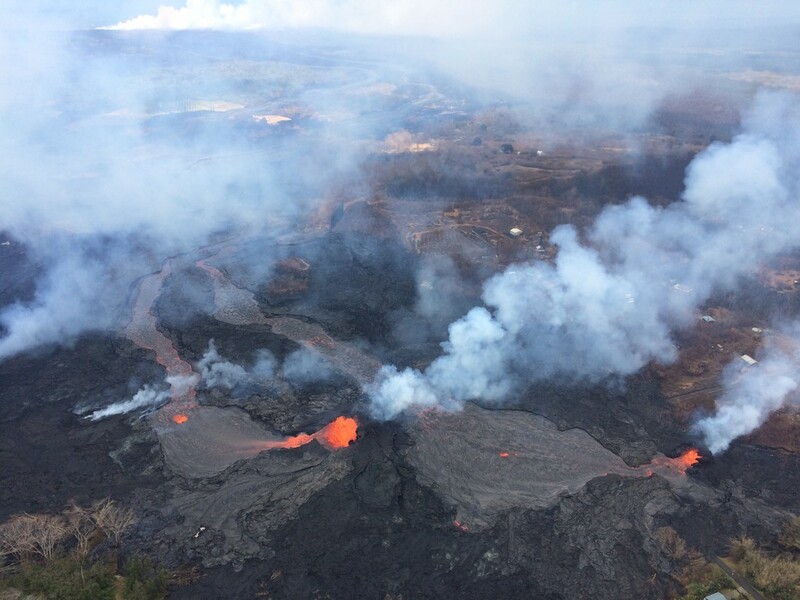 Fissures continued to open, but mostly emitted slow, sticky lava that didn’t travel far. Leilani residents continued to be allowed back during the daytime. Video: lava flow eats Mustang (dead battery; owner left it to focus on rescuing other possessions), another flow pushes through metal gate. 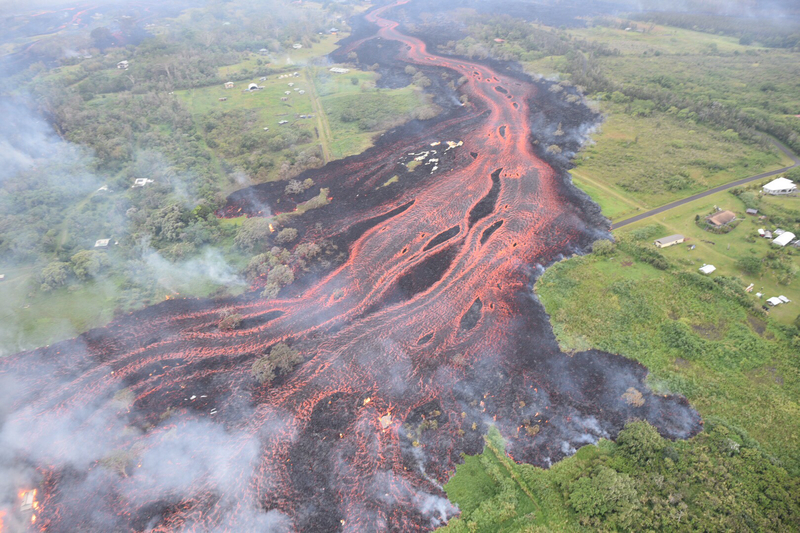 These slow-moving, clumpy, clanking flows that pile up like a rocky bulldozer are “a’a” lava. 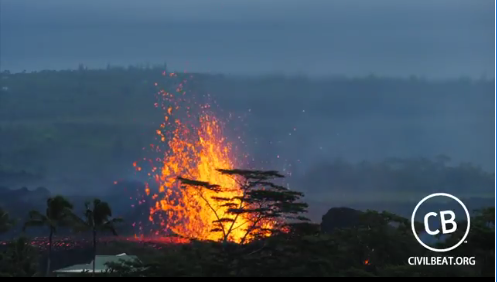 May 8: Evening Civil Defense Update from Big Island Video News with lava footage. 14 fissures by day’s end. 15 fissures by end of May 9, cracks (but not lava) open W. of Highway 130, back up rift zone. Fissure eruptions pause on May 10. Briefly.